The Write Question is a weekly video podcast all about writing. 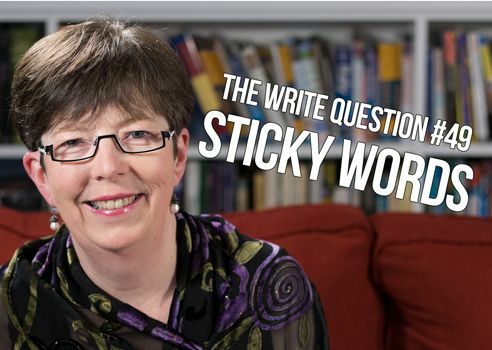 Today’s question focuses on sticky writing. Welcome to The Write Question, I’m Daphne Gray-Grant. Today we’re talking about sticky writing. I’m answering a question from Rodolfo Villanueva in Auckland, New Zealand. Here’s what he’s asked. Thanks for the question, Rodolfo. “Sticky writing” is such an evocative phrase that it gets people’s attention. Even though I’ve talked about it before — check out the link below — I’m going to do it again because the term is relatively new. In fact, if you do a Google search for “sticky writing” you’ll find that my own post on the subject usually comes up either first or second. What do these words have in common? I’d say the main thing is they don’t give you a visual image when I say them. For example, if I say the words, “dog,” “desk,” or “ice cream cone,” you probably visualize each of those things. But if I say the word “what,” or “every” you won’t get any visual image at all. That’s a problem because human beings are very visual creatures. A large percentage of our brain dedicates itself to visual processing. Did you know that 40% of all nerve fibres connected to the brain are linked to the retina — the light-sensitive tissue lining the back of our eye? Images grab our attention easily and we are immediately drawn to them. This is just one of the reasons why so many people consider Winston Churchill to be one of the best speech writers ever. He knew to fill his speeches with concrete words. Listen to this recording. Many of his words are short and concrete. They give clear visual images. He uses very few sticky words. You know the expression, a photo is worth a thousand words? Writers need to attend to that message, too. But be aware your aim is not to write WITHOUT sticky words. You just want to keep them to a minimum. Ideally, your sentences should contain fewer than 45% sticky or “glue” words. If they contain more, rewrite them to improve their clarity. Here’s an example. Morgan walked over into the second-hand car lot in order to see if there was a car she could buy for getting herself to her new job. The length of that sentence is 27 words. Now, here’s an improved version: Morgan checked the second-hand car lot for a car she could buy to drive to work. Do you see how that new sentence is much shorter? It’s only 16 words. And it’s much easier to read and understand. Finally, while we’re on the subject of sticky writing, let me wrap up with a quote from editor Naomi Tepper: “Cluttering your writing with unnecessary words will only hide your meaning and create additional work for the reader. Thanks for your question, Rodolfo. I hope this video helps you unstick your writing. Do you use too many sticky words?